Examine the water dimer system to determine what level of theory is necessary to determine the PES with chemically useful accuracy. All Hartree-Fock and Moller-Plesset (MP) results were calculated using the PC GAMESS version  of the GAMESS (US) QC package  . Density Functional results were calculated using Gaussian 98W . Results were calculated using standard methods (i.e. Hartree-Fock (HF) and HF with correlation corrections from Moller-Plesset perturbation theory (MP2, MP3, MP4 SDQ, and MP4 SDTQ)). For all the MP calculations we used the entire space of occupied and virtual orbitals for the calculation. No orbitals were omitted. We also used two Density Functional methods (B3LYP and MPW1PW91) which explicitly include correlation effects at the SCF level of calculation. Pople's standard split valence basis set with single polarization functions augmented by diffuse functions. Pople's triple zeta valence basis set with multiple polarization functions augmented by diffuse functions. Dunning's triple zeta correlation consistent basis set with augmenting diffuse functions. Dunning's quadruple zeta correlation consistent basis set with augmenting diffuse functions. Click on the Designation for complete basis set information. Linear dependence problems can occur when using very large Cartesian gaussian basis sets augmented with many diffuse functions. The problem arises from the presence of linear combinations of Cartesian gaussian functions that are equivalent to other functions in the basis set (e.g. X2+Y2+Z2 is equivalent to an S type function). This equivalence violates the basic assumption that the basis set consists of a sum of functions that are independent of each other. In this case, the problem was initially observed at the AUG-cc-pVQZ basis and required the removal of one s-type function (exponent value of 0.2067) from each Oxygen atom. Calculations were attempted using Dunning's AUG-cc-pV5Z basis but extensive linear dependence problems were observed. All attempts at their resolution resulted in basis sets that differed only marginally from the AUG-cc-pVQZ basis so these calculations were not performed. Our definition of Binding Energy takes into account basis set superposition errors (BSSE). These errors arise from the fact that there are more basis functions used to represent the combined system than there are to represent the individual components. See our Neon results for more details. Note: throughout the rest of this document we will refer to this method of binding energy calculation as double counterpoise or DCP. Eight water dimer geometries were established by fixing the Oxygen atom separation and then performing a complete optimization of all other geometrical parameters. These optimization calculations were carried out at the Hartree-Fock level of theory using the 6-31++G** basis set. These optimized geometries were used in all subsequent calculations. Note: The purpose behind this method for selection of these geometries was to find a consistently chosen set of geometries to be used for the rest of our analysis. They do not (and are not intended to) represent the absolute best estimate of the geometry of the water dimer. It appears that the 6-31++G** is not the best choice for binding energy calculation for this system. It is clear that the 6-31++G** basis yields results that are incorrect relative to the other, more complete, basis sets. This is more easily seen in the following chart where we look at the variance of binding energies in the 6-31++G**, 6-311++G(3df,3pd), and AUG-cc-pVTZ results from those of the AUG-cc-pVQZ calculations. From these results we find the 6-311. VTZ, and VQZ HF results differ little, one from the other, indicating these basis sets yield binding energy results increasingly closer to the limit of the Hartree-Fock method. The 6-31++G** is clearly not appropriate for use in this analysis. The VTZ and VQZ basis sets are the best, nearly equivalent, choices for this analysis. Again, we see the inadequacy of the 6-31++G** basis. We also see the converging behavior of the Binding Energy as a function of increasing basis set completeness. The best results are obtained with the VTZ and VQZ basis sets. Give the relatively small differences between the AUG-cc-pVTZ and AUG-cc-pVQZ results, we will use the AUG-cc-pVTZ basis for further analyses. These results are a bit odd. According to the theory, the results should increase in correctness from MP2 to MP3 to MP4 SDQ to MP4 SDTQ. Thus, we would expect the variances from the SDTQ result to be greatest for the MP2 method and the least for the MP4 SDQ method. As we see from the previous chart, the variances in the MP2 and MP3 are essentially equal with the MP4 SDQ variance being the largest. One might say this is a good thing because one could choose to use the MP2 method for the full PES with a significant reduction in computing requirements. However, I am concerned that the small MP2 and MP3 variance might be just a fortuitous accident. Therefore, just to be safe, we will choose to use the MP4 SDTQ method for future PES calculations. We will continue to monitor the MP2 results just to see if additional data provides a clue to the reason for this low variance behavior. For the water dimer, the DFT methods yield a physically meaningful result. In order to assess the utility of the results generated here, it would be reasonable to compare them with some of the principle Molecular Mechanics potentials currently used for large scale simulations of water and aqueous systems. One such water potential is the Tinker water potential, a polarizable multipole electrostatics model . This model is equal or better to the best available water models for many bulk and cluster properties so it is the one we use for comparative purposes. The congruence of the MP4 SDTQ and Tinker potentials is remarkable, for Oxygen-Oxygen separations greater than 3.0 Angstroms. 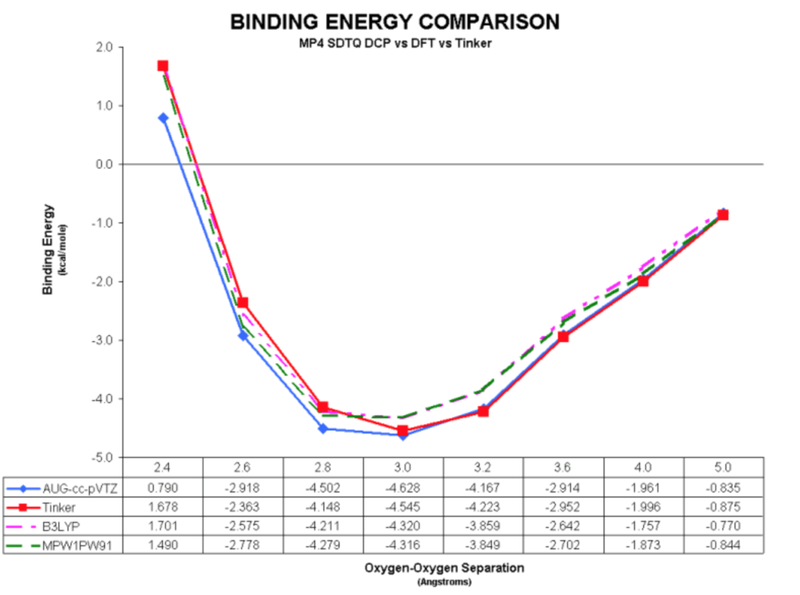 For separations less than 3.0 Angstroms, the agreement is less good with the Tinker potential being slightly more repulsive than the MP4 SDTQ results. Use the MP4 SDTQ method. All of S,D,T and Q are required to get accurate results. Use a substantial basis set with extensive polarization and diffuse functions, i.e. at least AUG-cc-pVTZ or better. Our results compare well with those of more empirical potentials derived from experimental data. Calculate a complete array of BE points for the water dimer using the AUG-cc-pVTZ basis set and the MP4 SDTQ method. At each point also calculate the charges at each atom (at the MP2 level). Take a look at multibody effects on the BE and charge data at each point. Fit that BE and charge data to a PES analytic function (probably of a type similar to the Tinker potential) with additional contributions for geometric variation/ deformation, charges as functions of geometry, and multibody effects. Perform a series of Molecular Dynamics runs that examine the sensitivity of various bulk water properties to variabilities in the key attributes of the PES. My sincere thanks to Dr. Alex Granovsky for making the PC GAMESS source code available to me, for our many discussions regarding the use of PC GAMESS, MP4 SDTQ methods and the criticality of taking into account basis set linear dependence. Thanks also to Dr. Jay Ponder for his assistance with the use of the Tinker Molecular Mechanics software. Tinker Molecular Mechanics v3.7, Jay William Ponder, Dept. of Biochemistry & Molecular Biophysics, Washington University School of Medicine, St. Louis, Missouri 63110 http://dasher.wustl.edu/tinker/ .